Forensic toxicology is a multi-disciplinary field combining toxicological principles, analytical chemistry and methods, analytical toxicology, clinical chemistry, pathology, pharmacology, investigative research, data collection and collation — and a certain amount of detective work. TCAS has extensive expertise in forensic toxicology with more than 28 years of conducting hands-on investigations. The ultimate goal of forensic toxicology is to correctly establish or refute causation to reasonable toxicological certainty. Aside from assessing each piece of evidence on its own merits, the forensic toxicologist must rule out other possible factors before drawing conclusions. Thus, the nature and steps of a forensic investigation are primarily based on the circumstances and available facts pertaining to the case itself. However, every case is different and there is no guarantee that there will be sufficient toxicological evidence to provide a decisive opinion. To produce scientifically credible reports and opinions, the expert forensic toxicologist must conduct his investigation and assessment pragmatically. Evidential factors may include medical records, symptoms, treatments, dosages, environmental conditions and events (sometimes over a period of many years), historical records, laboratory data, etc. In criminal investigations, crime scene evidence, police reports, witness statements, autopsy reports, postmortem interval and analytical toxicology reports all contribute to reconstructing events. Although the forensic toxicologist goes where the evidence leads, he must be prepared to factually recount on demand all of the investigative steps taken to derive the reported results. This is a critical responsibility as a forensic investigation may or may not lead to a determination of causation. Toxicological opinion(s) presented as expert testimony can significantly impact the outcome of a case. Although the outcome of a forensic investigation is relevant to the parties involved, proving or disproving a case is a matter for legal counsel. The toxicologist can only offer opinions and evidence to assist and educate the judge and the jury. 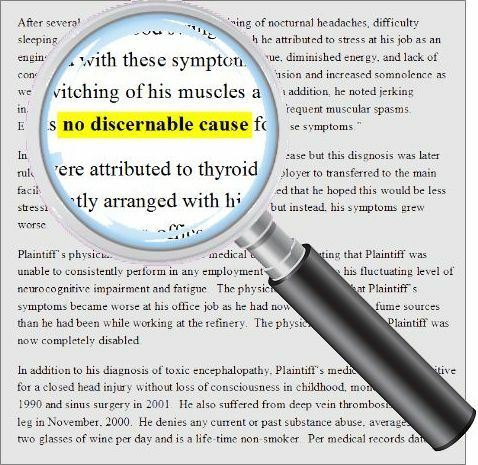 Case Knowledge: The toxicologist must be prepared to testify regarding the basic facts of the case and answer questions pertaining to circumstances. He may be questioned at great length on what might otherwise be presumed to be trivial matters. Thus, the toxicologist's testimony will only be regarded as credible if he possesses a working knowledge of case facts. Qualifications and Integrity: The toxicologist must stay within his area(s) of expertise, deferring non-toxicological matters to other experts and authorities. Foundation of Opinions: The toxicologist must be able to clearly and concisely communicate the generally-accepted method(s) that were used to conduct the investigation and/or arrive at opinions or conclusions. This may include explanations of any relevant studies or citations applicable to the investigation. Degree of Certainty: The toxicologist must define the degree of certainty of his conclusions. Toxicological opinions should be expressed as conclusions arrived at within reasonable toxicological certainty. Credibility: The toxicologist must expect that opposing counsel will attempt to refute or discredit his testimony and may even enter motions to exclude. In such instances, the toxicologist must be prepared to produce objective rebuttals supported by generally-accepted methods and peer-reviewed epidemiological studies and/or case evidence. Ethical Coherency: The toxicologist must be thorough without being redundant and complete without transgressing into unrelated areas. If confronted by difficult or misleading questions, he must respond with concise professionalism, integrity and dignity. As previously stated, the impact of a well-constructed toxicological assessment in litigation can be instrumental in assisting the judge and jury in understanding the case evidence. A scientifically credible report can provide key information as to the contaminant(s) present in an individual as well as the dose of each substance and whether the levels are consistent with a therapeutic dosage and/or adverse health effects. When such results are presented as testimony with respect to a substance's potential effect on an individual's death, illness, or mental or physical impairment, these factors can have profound evidentiary impact. For example, the results of a blood analysis from a driver involved in an automobile accident can be used to determine if the individual was under the influence of drugs or alcohol.1 Similarly, the amount of a substance in the blood can be compared to levels documented in generally-recognized, peer-reviewed studies to demonstrate or refute general or specific causation. Because the forensic toxicologist goes where the evidence leads, it is critical that the investigative procedure be based upon generally-accepted, peer-reviewed methods. The forensic toxicologist may be confronted with a massive volume of evidence which must be carefully analyzed, compiled and reduced to isolate relevant investigative components. In other cases, little or no physical evidence may exist. Thus, there are sometimes important investigative avenues to be explored. Although evidence may ultimately appear, the forensic toxicologist must sometimes develop opinion(s) from extrapolation of information. This may come from paper-based records, autopsy records, physician reports, company memos, police reports, first-hand accounts (in the form of sworn statements or deposition testimony), questionnaires, studies, specialized analyses of blood, tissue and/or environmental samples — in other words, every conceivable source of information. To this end, it is extremely important to be thorough when assessing the available data, particularly where data quality is concerned. For example, quality control can be critically important for some substance measurements and the forensic toxicologist should do more than merely accept summarized laboratory results. All available raw laboratory data should be acquired and reviewed, particularly the actual GC/MS spectrometry analyses for such methodological factors as (a) mass ion fit, (b) retention time, (c) baseline noise and other analysis artifacts. Any or all of these data components can prove to be relevant to the overall toxicological assessment. "While courts will go a long way in admitting expert testimony deduced from a well-recognized scientific principle or discovery, the thing from which the deduction is made must be sufficiently established to have gained general acceptance in the particular field in which it belongs." The following archive illustrates some of the methods and investigative techniques TCAS employs to conduct forensic toxicological assessments. Toxic exposure studies provide descriptive and instructional information pertaining to some of the various toxic agents with which TCAS has been involved on numerous occasions. Toxicology case studies are impartial and objective summaries of toxicological matters in which TCAS was retained for the purpose of assessing health-based factors which, in some cases, led to a determination of causation. No names or identifying information have been provided due to privacy and legal considerations. TCAS demonstrative (redacted), graphical image © Copyright 2017, TCAS, LLC. Thumbnail images from multiple sources as noted on referenced pages. "Although forensic toxicology is a challenging discipline imposing many requirements on the expert toxicologist, an investigative spirit and quest for accuracy can sometimes uncover scientifically credible discoveries that can strongly impact a case."